Do you want to make your party special with truly authentic Japanese food? sashimi platter, sushi roll platter, nigiri sushi platter, finger food platter or combination platter... We can arrange your party menu for you. Simply tell us what you want from our menu. 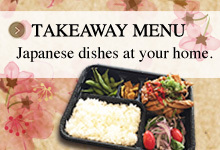 You can arrange your own bento box for your choice, as well!! Please give us a call. Please feel free to enquire about Functions. We help you to make your day special!